We all have the opportunity to be the change we would like to see in this world. 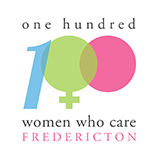 100Women x $100 = $10,000 for a local Fredericton charity. Are you ready to join local women to create local impact?